Introduction: What is a Signature Cluster? 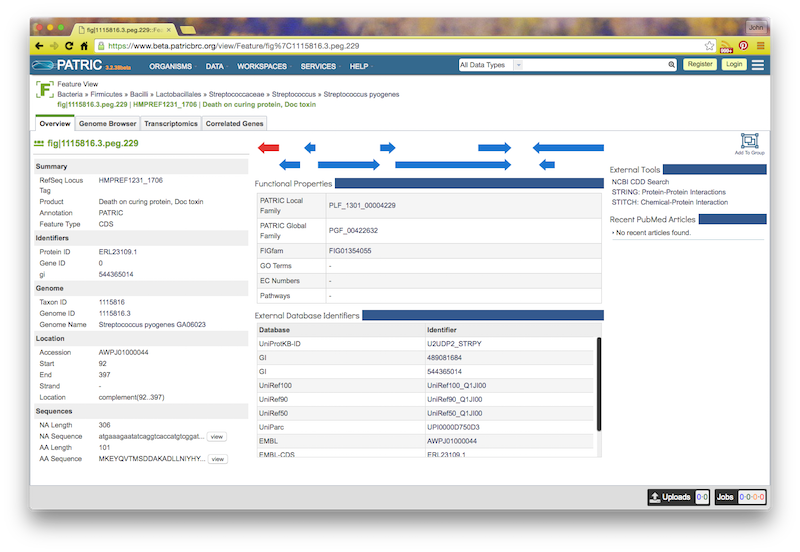 In this tutorial, we show how to use a tool that we have created to help you locate clusters of genes that distinguish genomes from two designated sets of genomes. For example, suppose that you have a set of genomes from a given species and a second set from different species in the same genus. In this case, we might look for chromosomal clusters that occur in most genomes from the specific species, but almost never occur in genomes from a different species in the same genus. This is just one of a growing set of tools you can use to access PATRIC data, but we think of it as extremely interesting. Define a set of closely-related genomes (usually a set of genomes from a single species). Call this set GS1. Define a second set of genomes which will be used for comparison and call it GS2. Typically this would be a set establishing a “context”. The usual contents of GS2 would be genomes from the same genus, but different species. Then define the notion of signature family as a protein family in which all members (or almost all members) occur in all genomes in GS1, but none (or very few) genomes in GS2. Finally, define a signature cluster as a set of instances of signature families that occur close to one another on the contigs of a genome in GS1. Since a signature cluster contains only signature families, by definition it can occur in GS1, but only very seldom in GS2. In this short tutorial we will compute signature clusters for Streptococcus pyogenes. 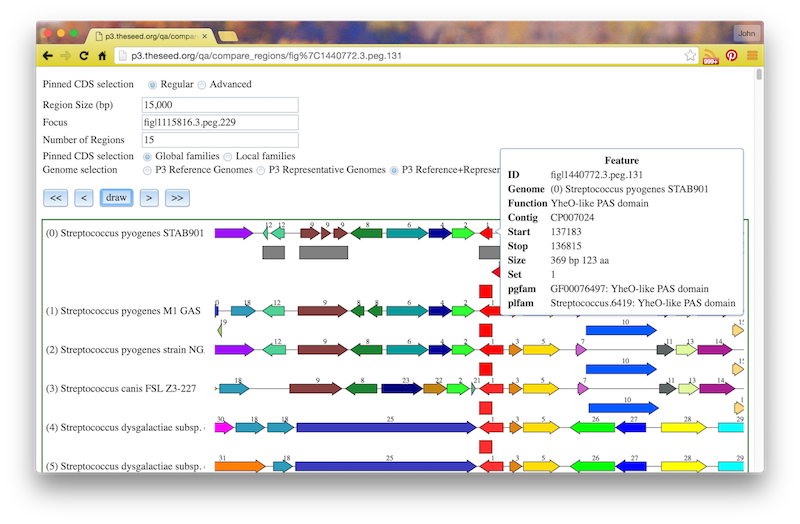 The actual computation can be done for any genus and species for which you have enough genomes (say, 20 within the species and 20 from different species within the same genus). The following three commands create three tables encoding genome sets. Note that each row in each table contains two fields– a genome id and a genome name. The first command looks at all of the PATRIC genomes, keeps only those which have ‘Streptococcus’ within the genome_name field, and writes out one line for each extracted Streptococcus genome. This is actually a fairly complex incantation, so we urge you to try to construct the corresponding command for a different species (say, Staphylococcus). 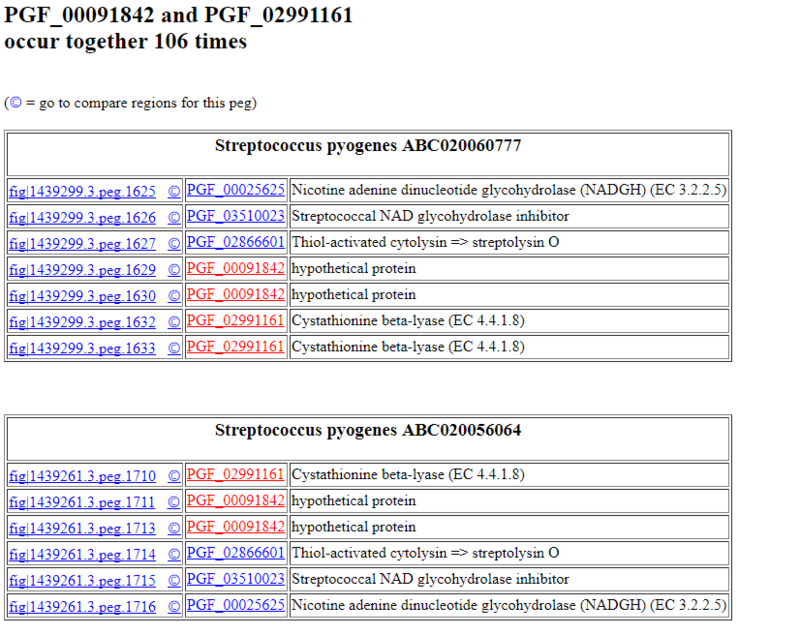 Then the p3-match commands create a list of Streptococcus pyogenes genomes and a set of Streptococcus genomes that are not from the pyogenes species. Once you have constructed your genome sets, verify that they include what appear to be a reasonable collection of genomes. First, we take 20 random genomes from GS1 and 20 from GS2 (these sizes are specified by sz1 and sz2) Then, we compute the protein families that occur in at least 80% of the genomes in GS1, but no more than 10% of the genomes in GS2 (the thresholds are specified by the min and max arguments). These are the signature families that we will use to search for signature clusters. Then we compute the desired signature clusters, based on the randomly selected genome sets. We save the clusters computed; this is called a single iteration. We redo the selection of random genomes, computation of signature families, and computation of signature clusters (added to a growing set), until we have completed the requested number of iterations (in our example, we specified “2”). Thus, we build up a collection of signature clusters recorded in the designated output directory. If you look in the file related.signature.clusters in this directory, you will see something like the following, showing the family pairs found and how many times each pair occurs. In the next section, we will show how to put these results in a more useful form. We have implemented a tool that, given two sets of genomes, will compute the signature clusters that occur (or tend to occur) in genomes from one set but not in genomes from the other. 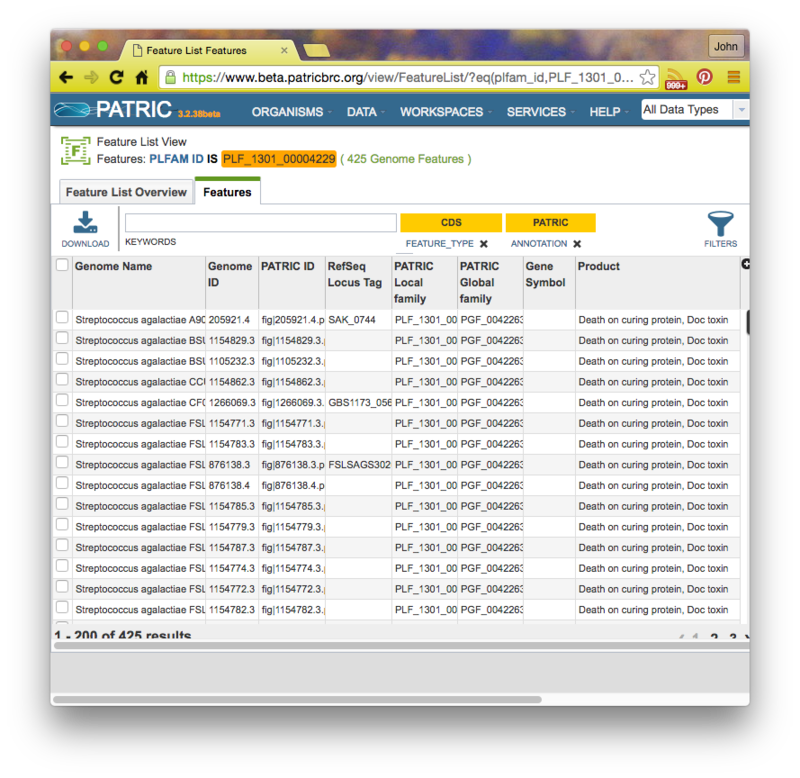 The sets of genomes are taken from the current release of the PATRIC database. We have illustrated one intended use: finding the signature clusters that distinguish a species from other species within a phylogenetic context (the genus). There are others that you might try. For example, if you wanted to find which EC numbers occur in clusters of signature families for Streptococcus pneumonia, but not in Streptococcus pyogenes, you should be able to locate these (as well as those that occur in S.pyogenes, but not in S.pneumo).